Over the past year I’ve received an increasing number of requests for information on Canadians who served during the Second World War. Obtaining their service file from Library and Archives Canada (LAC) is an important first step but access restrictions on some files means the process is not necessarily straight forward. This two-part article provides tips on how to navigate a process that is determined by when the individual you are researching died. Part 1 looks at service files relating to servicemen and servicewomen who were killed in action or who died of injuries or illness between the years 1939 and 1947. 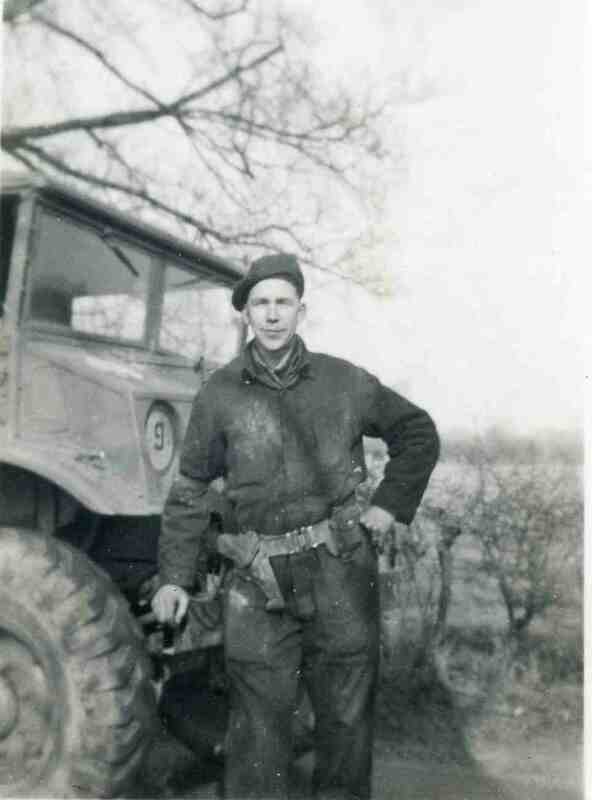 LAC’s Service Files of the Second World War – War Dead, 1939-1947 web page provides a good overview on service files relating to the more than 44,000 Canadians who died during this period. There are no access restrictions associated with viewing these service files. Their page includes a link to a database search option that lets you search for an individual by surname, given name or service number. 1. When searching for an individual in the database click the Item Number link in the results list to view details about that individual. Look at the top of the details page for a reference to a PDF file. Most of the service files have been digitized however only 1500 to 1600 can be downloaded directly from Library and Archives Canada. 2. 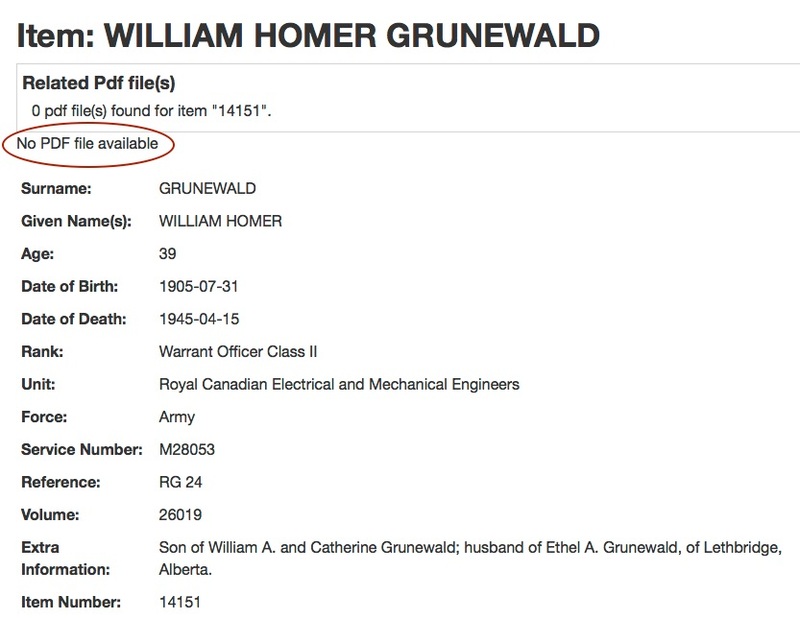 If the page indicates “No PDF file available” then the service file is not available directly from LAC but can be viewed for free on Ancestry.ca in their “Canada, WWII Services Files of War Dead, 1939-1947” record set. If you don’t have an Ancestry account you’ll need to create a free guest account but you do not require a subscription. There is an Ancestry page that includes more information on creating Free Accounts. 3. Be aware that the digitized service files available on LAC and Ancestry are what they call a “genealogy package“, a selection of the most important documents relating to their service rather than the complete file. It is possible to order copies of documents not included in the genealogy package from LAC and instructions for doing so can be found under Option 4 in the “How to obtain copies or consult a file” section. Reproduction fees will apply (40 cents per page) and it should take approximately one month to receive the documents. Update January 21, 2019: In the original version of this article I stated that wait times for these documents could be up to 14 months however this was incorrect as that only applies to restricted files. Thank you Lucy and Vicky for your comments that led to this update. You should also know that some service files can be extremely large. Last year I ordered a service file for a WW2 officer who died in the 1980’s and it numbered more than 800 pages! Many of these additional pages are administrative but they can also include correspondence which can be interesting, especially those documents written by the individual you are researching. Part 2 of this series will look into ordering WW2 service files for Canadian servicemen and servicewomen who died from 1948 to present. Thank you to Library and Archives Canada for their quick response to my questions. You should also be able to submit a formal ATIP request to be able to get the complete post-1919 service file within 30 days. It’s just $5 so if you can’t wait 14 months to get that information, I would suggest a formal ATIP request instead of the informal (free) ATIP request. Thanks for the tip on using the ATIP process. UPDATE #3: LAC has provided me with new information regarding the ATIP process which I will include in part 2 of my article. That 14 month wait is only for restricted files (those that survived the war). See the LAC website https://www.bac-lac.gc.ca/eng/transparency/atippr/Pages/Access-information-military-files.aspx#tab2 The files in this database are not restricted. If you order a copy of one of these open files, the turnaround time is less than a month because they are regular copy orders. About the ATIP requests, that only applies to restricted files, not open files, so you cannot use an ATIP request for open, unrestricted records like these KIA files. Thanks very much for pointing this out. I’ve updated the article accordingly!